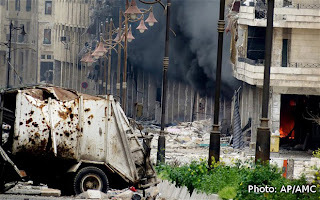 March 24, 2013 (LD) - For the US, UK, France, and its regional partners including Israel, Saudi Arabia, Turkey and Qatar, nothing would have suited their interests more than if the recent chemical attack reported in Aleppo Syria turned out to be (or could have been portrayed as being) the work of the Syrian government, or even "loose" weapons that had fallen into the hands of Al Qaeda terrorists the West both arms and condemns simultaneously. The military's version of events is that the home-made rocket was fired at a military checkpoint situated at the entrance to the town. The immediate effects were to induce vomiting, fainting , suffocation and seizures among those in the immediate area. A second source - a medic at the local civilian hospital - said that he personally witnessed Syrian army helping those wounded and dealing with fatalities at the scene. That Syrian soldiers were among the reported 26 deaths has not been disputed by either side. The military source who spoke to Channel 4 News confirmed that artillery reports from the Syrian Army suggest a small rocket was fired from the vicinity of Al-Bab, a district close to Aleppo that is controlled by Jabhat al-Nusra - a jihadist group said to be linked with al-Qaeda and deemed a "terrorist organisation" by the US. Thomson describes his contact in Syria as "a trusted and hitherto reliable source." Thomson's report, coupled with the silence across the West's governments and media houses, implies that indeed this version of the story falls closest yet to the truth. The West's silence in the face of an otherwise spectacular opportunity to advance its agenda may also indicate its faltering legitimacy and the loss of confidence that it can rewrite, at will, reality to suit its agenda - as it has done so many times in the past. This would implicate the West directly in giving terrorists using chemical weapons against Syria's population the knowledge and training to handle just such weapons. While the West continues to insist there is a divide between the terrorists it is arming, funding, and training, and the terrorists openly fighting under the banner of sectarian extremism, it is clear that even the US' hand-picked "interim government" is run entirely by the sectarian extremist organization, the Muslim Brotherhood. Thomson's report implicates the Al Qaeda affiliate al-Nusra as possibly being behind the attack, and notes that it is listed by the US as a "terrorist organisation." However, so-called Syrian opposition leader, Moaz al-Khatib, had personally defended al-Nusra, openly admitting it was fighting alongside his Western-backed front. As the West's credibility crumbles regarding Syria, and as its "success" in Libya continues to burn, its arming, training, aiding and abetting of terrorists carrying out increasingly horrific atrocities which now appear to include the use of chemical weapons, will haunt them not only in their pursuit of transforming the Levant, but in many years to come, in regards to all of their geopolitical ambitions.